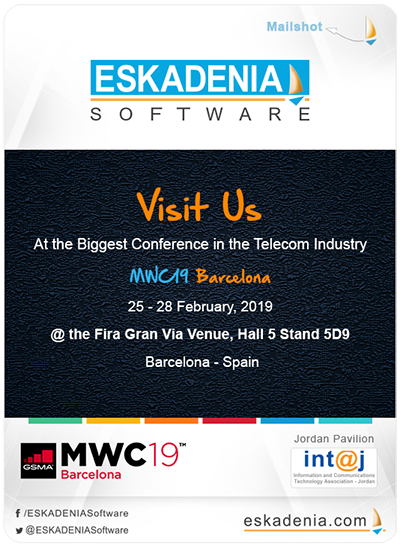 ESKADENIA Software, the leading Jordanian-based provider of software products & technologies, will exhibit at the GSMA MWC (Mobile World Congress) Barcelona, the world`s largest mobile event bringing together companies with the latest innovations and forefront technologies. MWC19 commences on the 25th to the 28th of February, 2019 in Barcelona, Spain. ESKADENIA Software will participate this year with a wide range of software products and solutions developed using the latest telecommunications technologies and standards, including TM Forum standards, to fulfil the requirements and technical needs of Communications Service Providers. During the conference, ESKADENIA Software executives and communications industry specialists will demonstrate ESKADENIA’s innovative systems in Customer Management, Fulfilment, Collections, e-Payments Switches, Messaging & Notifications, Sales & Marketing, and Charging & Billing. Being a part of MWC Barcelona creates great networking opportunities for ESKADENIA Software, presenting space to announce latest technological developments, open new opportunities and reinforce awareness of Jordanian IT products and expertise. MWC19 Barcelona will bring together leading players from across the mobile ecosystem, as well as adjacent industry sectors, such as automotive and consumer electronics, to highlight their latest technologies, products, and services. More than 2,400 leading companies are expected to participate in MWC19 with over 107,000 key decision-makers attending from around the globe. The exhibition floors will also include more than 40 country and regional pavilions where ESKADENIA will participate as part of the Jordanian Pavilion in cooperation with the Information and Communications Technology Association of Jordan (int@j). ESKADENIA® Software is a three-time MENA Award Winner & CMMI® level 3 certified company that is active in the design, development and deployment of a range of software products in the Telecommunications, Insurance, Enterprise, Education, Healthcare, and Internet application areas. The company is based in Jordan and has sales activities in Europe, the Middle East and Africa; more than 85% of its sales are exported to the global market. ESKADENIA Software is a customer-oriented organization that assists enterprises and promotes businesses by use of highly effective IT strategies, solutions and tools. With a customer retention rate of over 95% in more than 25 countries, ESKADENIA endeavors as a team to augment quality and customer gratification, build up perseverance, and foster innovation. ESKADENIA Software positively contributes and strongly believes in the crucial role of businesses in the development of their communities. For more information, visit www.eskadenia.com, or contact us at pr@eskadenia.com.